The soil is the foundation of a healthy garden and healthy plants. Without great soil, you will be spending a lot of your time fertilizing your plants and protecting them from pests and diseases. Great soil won't guarantee your plants will stay healthy, but it will mean they won't get easily stressed, will require less frequent watering, and will be less attractive to insect pests. You' should be able to gauge how healthy your soil is by looking at how your plants are doing. If they are growing lush and green, your soil is probably fine. If they seem to be struggling, then testing your soil is a wise thing to do. To get a true assessment of your soil's nutrient makeup would require sending a sample to a lab. Your local cooperative extension should be able to do this for you, at a nominal cost. But there are a few tests you can do at home, with materials from the kitchen. A soil pH test is a good start. 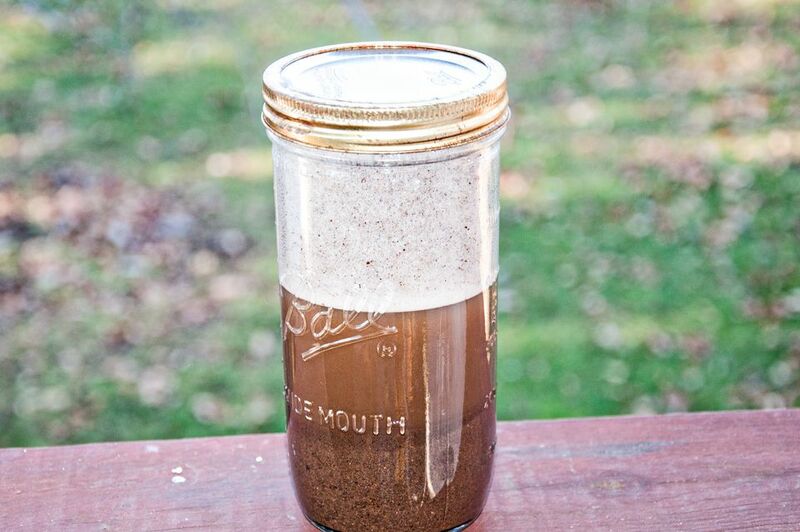 Here are instructions for a DIY Soil pH Test. But you will also want to check your soil's texture, to determine if you have predominantly sand, clay, or silt and what you will need to add to get to the ideal sandy loam. The balance of clay and sand levels affects how well your soil can retain water, and how hard plants will have to work to send down roots. This test is very easy to do. 1. Scoop up about 1 cup of soil from 4 - 6 inches below the surface of your garden. If you have a small garden, you can mix soil from 3 - 4 different spots. If you have a large garden or garden in different spots in your lawn, it would be better to test several samples separately. 2. Remove any stones, sticks, or other foreign debris and break up any large clumps. 3. Add the soil to your jar. It shouldn't fill more than half of your jar. If your jar is so large that 1 cup of soil fills it less than 2 inches, either get more soil or a smaller jar. You will need the soil deep enough to see the separate layers that will develop. 4. Add the detergent to the jar. The detergent is there to keep the soil particles separate. 5. Add water until the jar is about 3/4s full. 6. Put on the tight-fitting lid and vigorously shake the jar so that everything is well mixed. Make sure no soil is not stuck on the bottom of the jar. 7. Place the jar on a level surface to begin settling. Check it periodically over the next several days. As the soil begins to settle, it will separate out to sand, silt, and clay, in that order from the bottom up. Each layer will be a slightly different color, so you can see how the percentages stack up. Sand is the heaviest particle and will settle first. The bottom layer tells you how sandy your soil is. Silt is the next to settle. It will be a little darker than the sand and will form a layer on top of it. Clay may be heavy, but the particles are small and it is the last ingredient to settle. The clay should be a little lighter in color than the silt below it. Once the water on top seems clear, your soil sample is ready to read. There will probably still be stray bits of organic matter floating on top and it will be brown, but we're not concerned with that here. All you need to know is if your soil is predominately sandy or clay. If it is 80 - 100% sand, your soil is considered sandy. If it is anywhere over 50% clay, your soil is considered clay. From there, you can start thinking about how to amend it to get a loamy soil that is approximately equal parts clay, sand, and silt. That's the ideal soil that will drain well but still hold water long enough for plant roots to absorb it. This test is not going to give you as accurate ​of a reading of clay, sand, and soil percentages as the jar test, but it will give you a good idea of where you stand. Pick up a handful of damp, but not soaking wet soil. Give it a good squeeze in your hand, so that it forms a ball. Then prod it gently with your finger. If it falls apart easily, or won't stay in a ball at all, your soil is predominately sand. If the ball resists the prodding, or cracks but doesn't crumble, your soil is predominately cay. Once again, you need to take steps to amend your soil to get that perfect loamy mix of equal parts clay, sand, and silt.